Due to the use of the very latest technology, your installer needs to be trained in and fully understand the necessary procedures required for the startup and installation of this equipment. 4 ton system seer rating is 17.5 and 5 ton is 17.0. A heat pump is a central air conditioning and highly efficient heating system that will "extractâ€ heat from the air in the wintertime for cost effective heating comfort in all but the most severe winter climates. The system actually "reverse-cyclesâ€ in the heating mode and captures heat from outside and "pumpsâ€ it into your home. The newest DSZ series 18 seer ultra-efficient Goodman heat pump condensers represent the latest generation design, packed with high technology features -- Like the Copeland Scroll compressor, absolutely the smoothest, quietest, most durable compressor ever developed. Two-Stage Cooling Function means that your system will spend about 80% of the time operating in low-speed cooling, The system will operate for longer periods in a super efficient mode resulting in lower operating noise, better humidity control, and less variation in temperature throughout your home. And, because of the flexible capacities offered by two-stage compressors it's like having two systems in one - During the very highest demand times, your system will operate at full capacity for maximum cooling and heating output. During the rest of the season, your system will operate at reduced capacity for maximum energy savings and humidity control. It all adds up to the lowest possible energy costs and comfort like you've never experienced before. * Note - Due to the use of the very latest technology, your installer needs to be trained in and fully understand the necessary procedures required for the startup and installation of this equipment. Seasonal Energy Efficiency Ratio, or SEER, is the measurement of a heat pump air conditioner's cooling energy efficiency. This rating system was developed by the U.S. Department of Energy to allow comparison between various models. The newest DSZ series Goodman air conditioner exceeds the federal 13 seer minimum by 38%, ensuring maximum energy savings. And the higher the SEER number, the greater the efficiency and the lower your operating costs will be. The DSZ series 18 seer Goodman air conditioning system can lower your energy costs by 60% or more when compared to an 8 seer/5.6 HSPF system. Your new Goodman 18 SEER central heat pump system is not only easy on your wallet, but is also easy on our environment. Since this refrigerant does not contain Chlorine, it is more environmentally friendly than R-22 refrigerant, the refrigerant currently used in most air conditioning systems. Introduced as the alternative to R-22, R-410a has helped increase the durability and reliability of air conditioning compressors . The coil is a rifled, refrigeration-grade copper tube and aluminum fin construction for maximum durability and heat transfer. Goodman doesn't cut corners on the cabinet either â€“ it is constructed from heavy-gauge, zinc-clad G90 galvanized steel and is designed to help prevent damage from yard debris and the elements. The special polyester powder paint finish is "baked-onâ€, providing an extra measure of protection for years of long-lasting good looks. This construction design looks great in any architectural environment. These high-quality components ensure that your new Goodman air conditioning system will comfortably cool your home for years to come. The last thing you want is to hear a noisy heat pump starting up at night. Goodman understands and builds each unit to ensure that your heat pump won't interfere with a good night's sleep. 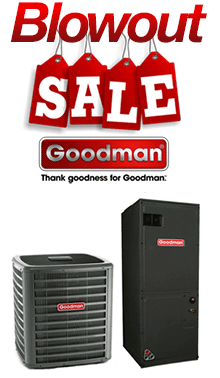 Don't be fooled by the affordable price tag â€“ Goodman is a leader in home heating and cooling systems. In fact, Goodman is the second largest HVAC manufacturer in the world providing the longest and most comprehensive warranty's in the industry. Every single Goodman heat pump is run-tested before shipment and leak-tested three separate times during the manufacturing process to ensure a trouble-free installation. Plus, to save costs at installation time the heat pump condenser is pre-charged with R410A refrigerant for up to 15-20 feet of tubing. The new DSZ series Goodman heat pumps offer affordable, reliable, and quiet operation you can count on year after year. Once in a while, a new technology is developed that gains widespread acceptance through superior function and design. The Copeland Scroll Compressor has gained respect and industry-wide acceptance through time-tested field use and not from laboratory theory. The Copeland Scroll Compressor has proven itself to be the quietest and most dependable ever created. The Copeland Scroll technology is based on the concept of compliance; two scroll members interact to simultaneously achieve high efficiency and durability. This efficient twisting motion greatly reduces the numbers of parts that can fail while eliminating the inefficient up and down piston motion of ordinary compressors. 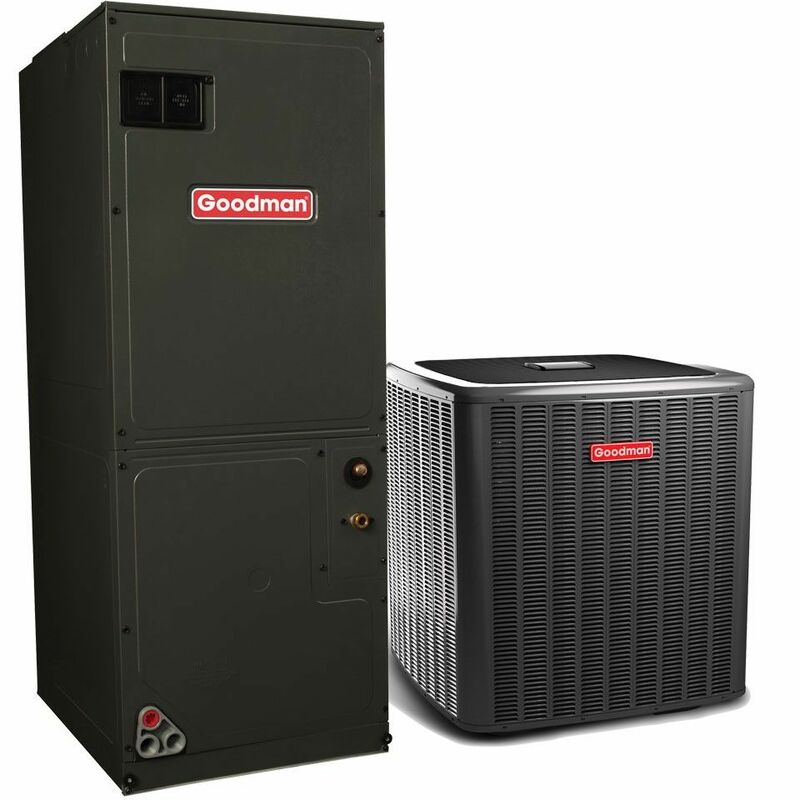 The Goodman variable speed air handler is your ticket to superior heating and cooling performance. For quiet performance, improved humidity control and greater comfort in both heating and cooling this air handler simply can't be beat. A variable speed air handler is dramatically different from a standard air handler in that it features the high efficiency Electronically Commutated Motor (ECM) by General Electric. The Goodman variable speed air handler provides whisper-quiet air delivery thanks to the General Electric variable speed DC motor. By "ramping upâ€ slowly at startup, this motor completely eliminates the harsh "impactâ€ noises created by full speed startup in ordinary air handlers. This "soft startâ€ significantly reduces fan and motor noise so you can rest easy. You simply can't buy a quieter air handler. Best of all, this air handler functions automatically - No adjustments or controls to fiddle with. Just set your thermostat and walk away. The air handler senses the optimum operating parameters while you and your family enjoy the performance that only variable speed technology can provide. TThe ECM Motor enhances performance because full air delivery is only needed a small portion of the time. During lower demand times this motor reduces its speed, providing up to 4 times better humidity control, better air distribution throughout your home, and greatly reduced operating costs. Another important feature of the Goodman variable speed air handler is the reduction of what is referred to as "cold blow," or the cold blast of air upon heating startup. "Cold blow" results from cold air that develops in the duct system while the heat is in an off-cycle. When the air handler heater fan cycles on, this cold air is moved very quickly into your home resulting in an uncomfortable draft. This Goodman variable speed air handler virtually eliminates cold blow with a "soft start," or a gradual increase in fan speed over the initial 3 to 4 minutes of the on-cycle. This cold air is combined with preheated air from the air handler blower and is delivered at a slower velocity until it reaches full operating temperature. Improved heating comfort and a dramatic reduction of the uncomfortable drafts associated with non-variable speed air handlers. The included Thermal Expansion Valve (TXV) for your new heat pump system will result in superior performance across a wide range of operating conditions, as well as energy and cost savings. A TXV meters the flow of refrigerant to the indoor evaporator coil of your air conditioning system. Much as our eyes automatically adjust to varying light conditions, a TXV automatically adjusts to changing cooling requirements. When conditions call for maximum cooling, the TXV increases the flow of refrigerant to the indoor coil. When the cooling demand is lower, the TXV automatically restricts the flow of refrigerant, increasing the system efficiency and reducing energy costs. Standard variable speed air handler features include a fully insulated cabinet for quiet operation, an adjustable multi-speed motor, copper tube and aluminum fin coils, and a transformer and blower time delay for maximum efficiency. This variable speed air handler also includes a supplemental heating element up to 15KW for increased heating capacity. 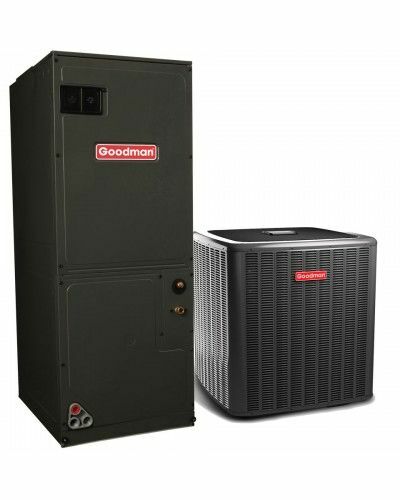 The Goodman variable speed air handler is versatile and can be installed as an upflow (ductwork above the air handler), downflow (ductwork under the air handler), and horizontally (air handler in an attic, crawlspace, or basement). If you are capable, you can do most of the installation yourself and then set up a service call for a professional to come and open the refrigeration system and check the charge.